Who crochets when it’s 100 degrees? Call me crazy, but I started a major crochet project in the middle of a heatwave. Yes, I still have the pool table pocket nets to work on, but they’re wool. Wool is hot to work with, so the pocket nets are reserved for slightly cooler days. When the mercury soars into the triple digits I want to work with cooler things like cotton or bamboo yarns. In the back of my mind I’ve always wanted to make a cotton bedspread. 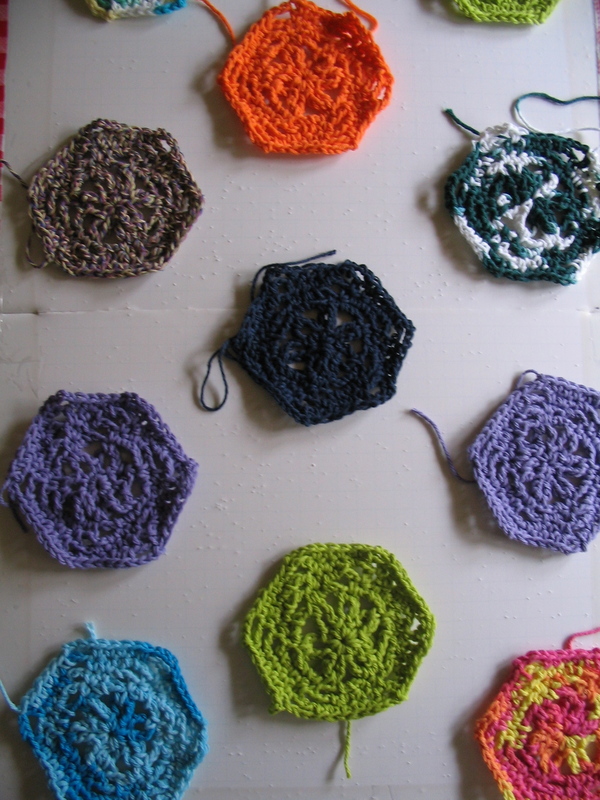 I knew I didn’t want a traditional “granny square” motif, so I dug through an old stitchery book and found a versatile hexagonal motif that had a bit of motion to it – it was labeled “Paddle Wheel” but I call it a Spinning Hex, since it sort of looks like it’s turning. Aside from using cotton, another cool thing (pun intended) about crocheted motifs is that you can usually make them as large or small as you like. Mine are small but not tiny at 5″ from point to point or 4.25″ from edge to edge. That means no bulky fabric piling up on your lap while you work. Right now this project is all about using up scrap yarn. I haven’t figured out how many individual blocks I’ll need for the bedspread yet, but I’ll probably need to throw in some additional colors before I’m ready to start piecing things together. Now it’s getting hard to look at the hexagon tiles on the bathroom floor without mentally plotting out where I want the colors to go. What are some of your favorite ways to turn leftover materials into something new? 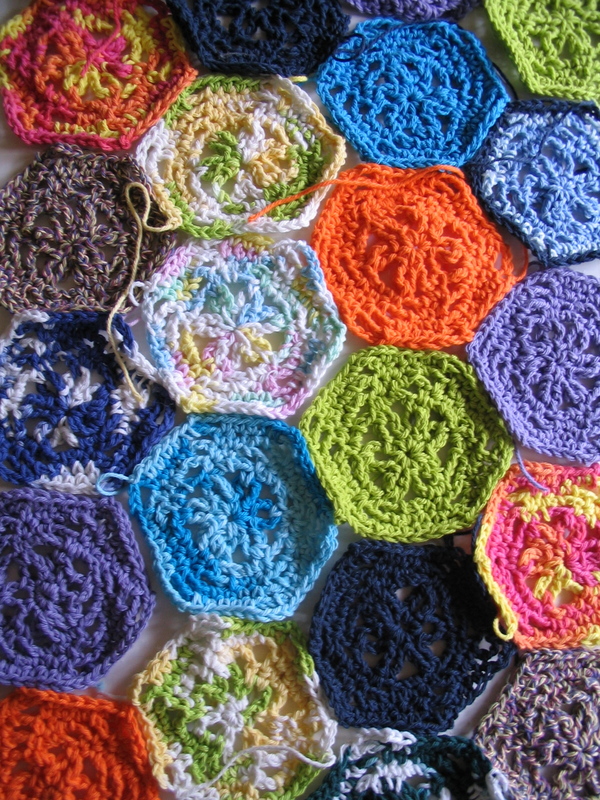 Posted on July 21, 2012, in Creativity, crochet, design, motifs, Projects, summer and tagged bedspread, crafts, creativity, crochet, design, heatwave, motifs, Spinning Hex, summer. Bookmark the permalink. 6 Comments. The bedspread is going to turn out beautiful! I love the colors. Thank you for the great post! Thanks. Love the colors on your peace sign poster, too, BTW. Well you have to start now to be ready for winter. Actually I’m hoping this will be a lightweight bedspread for next summer. That’s the plan, anyway. Awesome choice!!! I crochet in the heat to. I love it but it comes and goes, I won’t touch anything for a few weeks/ months, then I can’t get enough. Can’t wait to see your finished project!!! My motivation wavers now and then, too, so it could be a long wait to see the finished project. Right now I only have about 30 pieces made. I will need hundreds. The good thing is they only that about 10 minutes each.